Oh, life is so busy right now. Today is my first day “off” since the start of the semester so it will be my catch-up day. But, I am a (wo)man of my word, so you will get your post for the week before I get down to business. I can’t remember when I made this but I do remember it was good. I have made variations of it every few months for the past year. Jason always loves it and it is simple to make, so it is a win-win situation. In a large skillet, brown ground turkey and onion. Add the seasoning packet and peppers once the meat is nearly done. Cook until peppers have only a little crunch left. Preheat oven to 350F and grease a casserole dish. Top the shells with thin, but complete layer of the meat mixture. 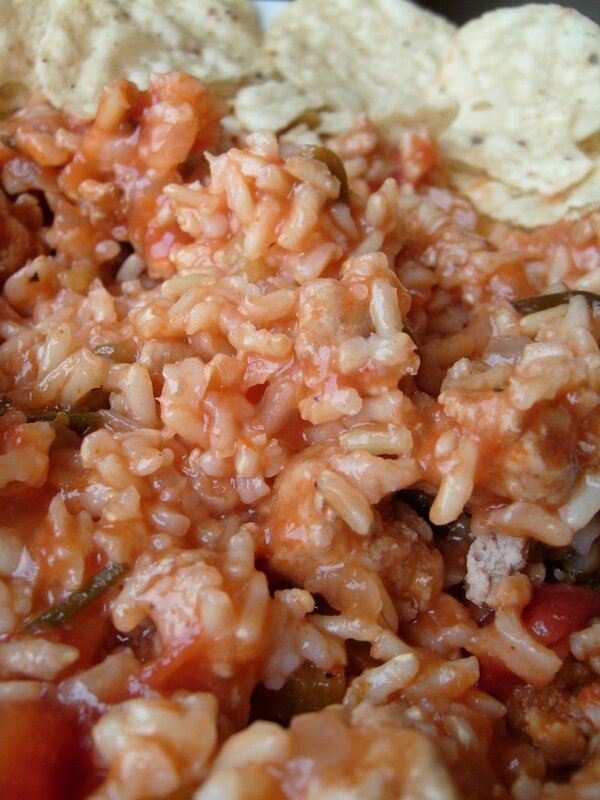 Spread salsa over the meat mixture and top with half of the cheese. Layer with sells and follow with just the meat mixture. Top with shells and then top the shells with cheese. Bake for 20-30 minutes (depending on your oven), or until the cheese is golden. The other day I asked Jason what he would like for dinner, because I was out of ideas at the time. 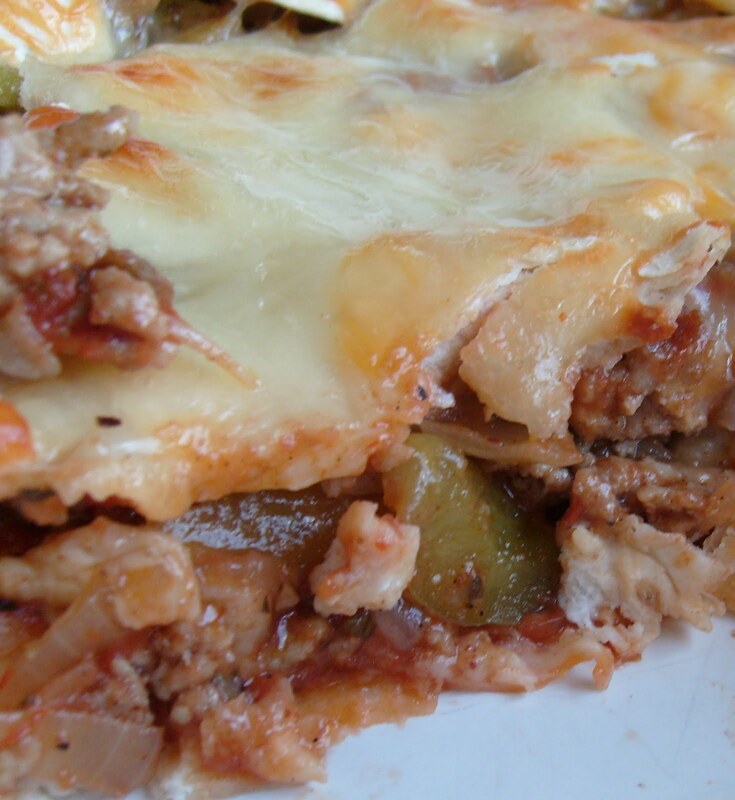 He said lasagna and then it came to me; make a lasagna with Mexican-based ingredients. Jason sounded a little skeptical, but went with it, like he usually does. The result – AMAZING! Jason finished off 4 slices easily and wanted t more…he decided to stop since he knew we had delicious chocolate candies from my parents that we would have later for dessert. This is slightly different than lasagna because it has minimal cheese. Jason and I don’t like ricotta and I didn’t feel like grating cheese when I prepared this in the morning. The only cheese is on the top, but it still tastes great! In a large pot, bring about 10-12 cups of salted* water to a boil (if you cover the pot it will boil faster since less heat is escaping). Place 3-4 lasagna noodles in the pot and boil for 4-6 minutes, or until slightly soft. Remove from the pot and rinse with cold water to stop the cooking process. Watch out…they are VERY hot! Place on a dish towel to cool. Repeat the process. In a large skillet, brown the ground turkey. Once fully cooked, add the onion. Since ground turkey is lean and there is little fat that come off of it, I like to just cook the onion in the fat that is there instead of going through the extra steps just to swap out a few grams of saturated fat for unsaturated fat (normally you would need to drain and rinse the meat, set in a separate bowl, wipe out the pan, add oil, heat oil, and then add the onion – this saves me 5 minutes!). Cook the onion for 5 minutes and turn off the heat. Leave the skillet on the burner. Add the frozen corn (still frozen). The heat from the pan will thaw the corn. Once thawed. Add the black beans. Spray a 13 X 9″ baking pan. Add one layer of noodles to cover the bottom. Top with half of the meat and vegetable mixture. In a back-and-forth motion, top with about 1/3 cup of spaghetti sauce and 1/3 cup of salsa. I didn’t measure when I did, so add as much as you think is needed. Top with the rest of the noodles. Top those with the rest of the meat and vegetable mixture. Sprinkle 1/2 cup of spaghetti sauce and work into the meat mixture using a spatula or spoon. At this point you have two options: you can place the lasagna in the refrigerator for up to 24 hours before you bake it, or you can bake it right away. Once you are ready to bake, heat the oven to 400F. Don’t add the cheese yet! Bake for 30 minutes in the center rack. Remove from the oven and top the lasagna with your choice of cheese. We used about 1/3 of a block of mozzarella and 1/3 of a block of mild cheddar. Place back in the oven on the center rack and bake for 5-7 minutes, or until the cheese is melted. lowers the freezing point, causing the ice to melt at 32F and below! At my bri dal shower, my bridesmaids had the coolest idea…since they know I love to cook, they had each person attending bring a recipe for me to try out on Jason. One of them was for Spanish Rice from my Aunt Diane. I made a few modifications, such as using fresh parsley instead of dried and using whole grain rice instead of white rice. Overall, the recipe is good. The only thing Jason suggests is more spice, and I agree. I would probably add some cumin and chili powder. Mix all ingredients together in a pan; cover and simmer for 3/4 of an hour to 1 hour, stirring occasionally.